Senator Susan Collins (R-ME) walks to the Senate floor ahead of a vote on the health care bill on Capitol Hill in Washington, U.S., July 27, 2017. WASHINGTON - U.S. Senator Susan Collins rebuffed intense lobbying from fellow Republicans and the promise of money for her state in deciding on Monday to oppose - and likely doom - her party’s last-ditch effort to repeal Obamacare. The most moderate of Republican senators joined John McCain and Rand Paul in rejecting the bill to end Obamacare. It was a major blow for President Donald Trump who has made undoing Democratic former President Barack Obama’s signature healthcare law a top priority since the 2016 campaign and who pressured Collins in a call on Monday. The bill’s sweeping cut in funding to Medicaid, a program for low income citizens and disabled children, was her top reason for opposing the bill, said Collins, from the state of Maine where 20 percent of the population depend on the program. “To take a program that has been law for more than 50 years, and make those kinds of fundamental structural changes ... and to do so without having in depth hearings to evaluate the impact on our most vulnerable citizens was unacceptable,” Collins said outside the Senate chambers. She also opposed the bill for weakening protections for people with pre-existing conditions, such as asthma, cancer and diabetes. 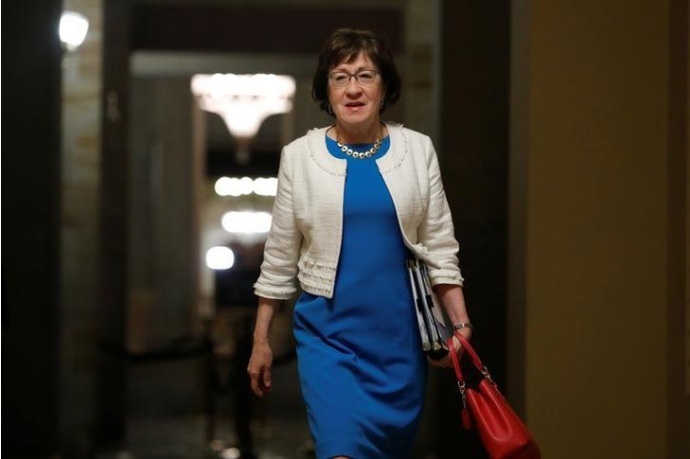 Collins’ decision came even after the sponsors of the bill, Senators Lindsey Graham and Bill Cassidy, offered a boost in federal health care funds of 43 percent for Maine and benefits for states with other undecided senators. Republicans have vowed to get rid of the Affordable Care Act, or Obamacare, since it was passed in 2010. While it extended health insurance to some 20 million Americans, they believe it is an unwarranted and costly government intrusion into healthcare, while also opposing taxes it imposed on the wealthy. Republicans hold a slim 52-48 majority in the Senate and are up against a tight September 30 deadline to pass a bill with a simple majority, instead of the 60-vote threshold needed for most measures. Senate Majority Leader Mitch McConnell wanted to hold a vote this week, but it is not clear he will do so now that three senators have said they will cast “no” votes. Graham dismissed notions that the bill was the last chance for Republicans to get rid of Obamacare and pledged to keep working on the legislation. Collins and McCain, who voted against the last major repeal effort in July, have both advocated for a bipartisan solution to fixing the parts of Obamacare that do not function well. U.S. hospital stocks were down across the board as the bill struggled. Shares of HCA Healthcare Inc and Tenet Healthcare Corp were hit particularly hard, falling 2.5 percent and 5.7 percent, respectively, on Monday. Collins announced her opposition shortly after the non-partisan Congressional Budget Office said that the number of people with health insurance covering high-cost medical events would be slashed by millions if it were to become law. CBO also found that federal spending on Medicaid would be cut by about $1 trillion from 2017 to 2026 under the Graham-Cassidy proposal, and that millions of people would lose their coverage in the program, mainly from a repeal of federal funding for Obamacare’s Medicaid expansion. The Trump administration, including Health Secretary Tom Price had lobbied her hard in recent days, Collins said. “The president called me today, the vice president called me in Maine over the weekend, Secretary Price has called me, it would probably be a shorter list of who hasn’t called me about this bill,” she said. Trump had not called Collins before the vote in July. The Senate held its first hearing all year on the proposed Obamacare repeal on Monday, but it was immediately disrupted by protesters who forced Senate Finance Committee Chairman Orrin Hatch to postpone its start by about 15 minutes. Police arrested 181 demonstrators, including 15 in the hearing room. The protesters, mainly from a disability rights group and many of whom were in wheelchairs, were forcibly removed one-by-one from the hearing room as they yelled, “No cuts to Medicaid, save our liberty.” The hearing eventually proceeded for about five hours, but protests could be heard outside for more than an hour. A new CBS poll released on Monday said that a majority of Americans, or 52 percent, disapprove of the Graham-Cassidy bill, while 20 percent approve. The poll was taken between Sept. 21 and 24. U.S. Senator Susan Collins rebuffed intense lobbying from fellow Republicans and the promise of money for her state in deciding on Monday to oppose - and likely doom - her party’s last-ditch effort to repeal Obamacare.